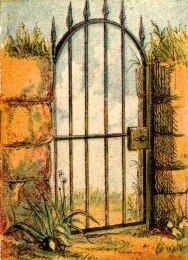 Vintage drawing of a garden gate from a public domain children’s book. Which side of the gate do you think the drawing is? Seems like the perspective is from inside the garden looking out onto a meadow in the background. With stone columns, iron bars and a lock, this garden gate stands ready to keep out virtually any invader – well, at least those invaders too big to squeeze through the bars.